By Vic Mizzy. Arranged by Andrew Grenci. Score, Set of Parts. 6 pages. Published by Andiss Music (www.andrewgrenci.com) (H0.244507-4800). Here is the iconic, universally recognized, them from the classic TV show, Broadway show, and film - The Addams Family. 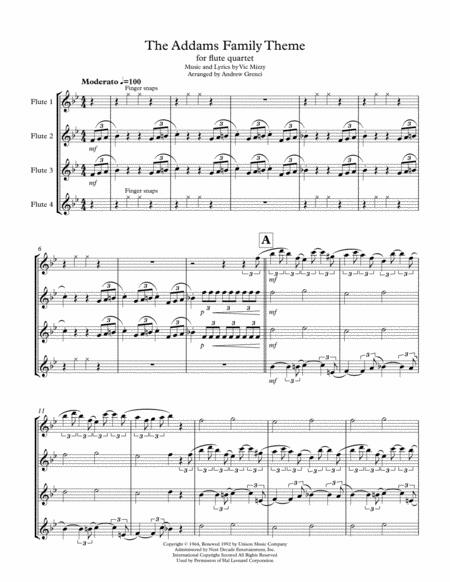 This arrangement for flute quartet is perfect for middle or high school level, and fun for players and audience alike. Listen to the mp3 which gives a pretty accurate rendition of this charming and humorous arrangement. .